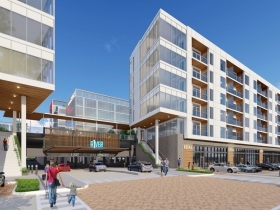 R1VER rendering looking south. Rendering by Rinka Chung Architecture. Ever since the Harbor District released its land and water use plan, the real estate market there has really been heating up. No surprise there. But it’s still great to see a wildly underutilized and cared for part of the city’s lakefront get some attention. 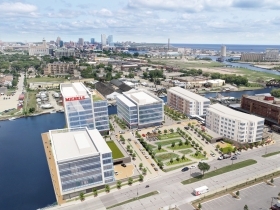 This week came Michels Corp. released its plans for its large development with plans for offices, a hotel, apartments and commercial space. Now, with a regional office, Michels will be adding roughly $100 million worth of development to the new Harbor District with this development called R1ver. Who comes up with these names? Also this week, a piece of land currently used for boat storage was purchased for $2.1 million, as Corrinne Hess at BizTimes reported. The property borders the Michels site, and the real estate agents selling the property clearly recognize the future of the area telling Hess it would be prime for redevelopment in the future. It’s interesting to see how fast investments and plans for some big pieces of the district are coming together. 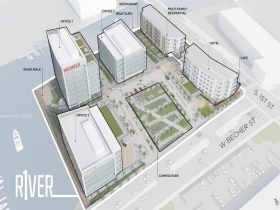 As I mentioned, with the Harbor District water and land use plans being released, developers have a blueprint for the neighborhood that was developed by local stakeholders, the city, and even some of the developers. 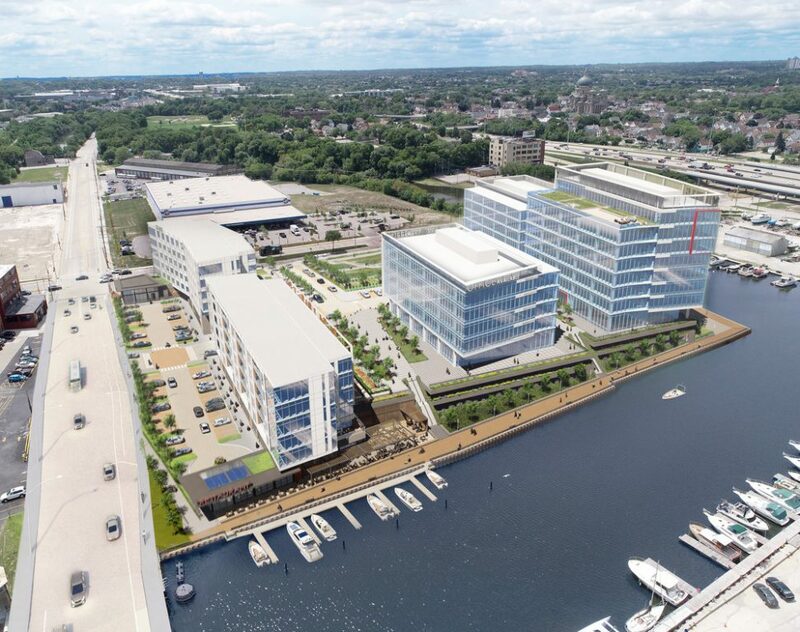 For example, David Stegeman of the Michels Corporation is on the Harbor District board of directors, Robert Monnat of the Mandel Group was part of the plan advisory group (along with more than 50 others). Mandel is another developer already pledging investment with a massive $130 million mixed-use development planned in the district. Even industrial parcels are changing hands. Komatsu, the heavy equipment manufacturer, is looking at moving some manufacturing there, as Sean Ryan of the Milwaukee Business Journal reported. Sources also indicate an office component could be in the work. It doesn’t hurt that the district is bordered to the west by the Walker’s Point neighborhood. Even a person casually interested in Milwaukee real estate can see that neighborhood is booming. This week Tom Daykin wrote a piece about all the development headed for the district and he quoted developers, city officials and local environmental advocates extolling the promise of the Kinnickinnic River as an attraction. Department of City Development Commissioner Rocky Marcoux was even quoted saying, “Now is the time for the renaissance of the Kinnickinnic.” The city, as is standard practice, has pledged to assist in funding for a riverwalk on the river. Cheryl Nenn of Milwaukee Riverkeeper told Daykin the river would be receiving a better grade from the group in its respected River Report Card for the Milwaukee Water Basin. Nenn sounded positive in Daykin’s story, but the Kinnickinnic is still the Kinnickinnic. It’s still the most urbanized watershed in the state, concrete and the runoff it produces abounds. And as she told me in 2017, the river is 90 percent impervious to water quality intervention. That’s bad. But, restoration efforts are underway. And if nothing else, I hope the development in the Harbor District will inspire residents living and working there to better appreciate and care for our waterways. And if the developers want the natural streams and riparian wildlife to be perks for future tenants, then they’d better work to take care of them too. Along with office space, hotels are quickly becoming a hot ticket real estate investment in downtown Milwaukee. The real estate market in this part of the city has been cooking for years. In recent months investments in hotels has become quite the trend. This may be due to the Milwaukee Bucks arena district or maybe it’s just part of the trend in the real estate market that started years ago. Or perhaps the Wisconsin Center District plans for a new convention center are inspiring some. 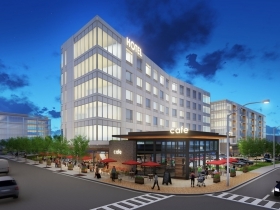 Whatever the reason, the hotel market downtown continues to evolve. 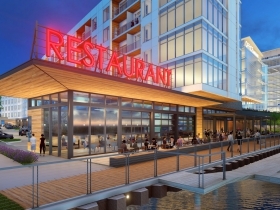 A few of the recent projects include the Cambria Hotel coming to Westown, the downtown Hyatt being restored, the Drury Plaza Hotel being developed in East Town, the Hyatt Place Hotel near The Brewery and the Courtyard by Marriot selling for $20 million. And this week, as Hess reported, Johnson Controls sold two buildings, one on N. Jefferson Street, the other on E. Michigan Street downtown to a developer with plans for hotels.